I swear, you would think that I would learn by now to NEVER go to the vending machines at work. Today I brought a sandwich for my lunch, and I wanted to try to find a low calorie option for some kind of crunch to go with it. Does anyone else feel like a sandwich isn’t complete without its crunch sidekick? Sometimes our vending machines actually have baked chips, but I wasn’t fortunate to find those today. I really wish calories were on the front of chip bags that are on display. Instead you look for key words like baked, or low-fat. I first chose a small bag of Quaker Baked Cheddar Snack Mix. As soon as I turned the bag over I realized that I had made a bad choice. For such a small bag, it still had 230 calories and 8 grams of fat. Sometimes that’s the amount of calories I eat total during lunch! It all depends on the day and what kind of activity I will be doing. Tonight I’m not sure what kind of exercise I will be getting because I have an appointment after work, and it will depend on the time it ends. With that being said, I wanted a lower calorie lunch today. 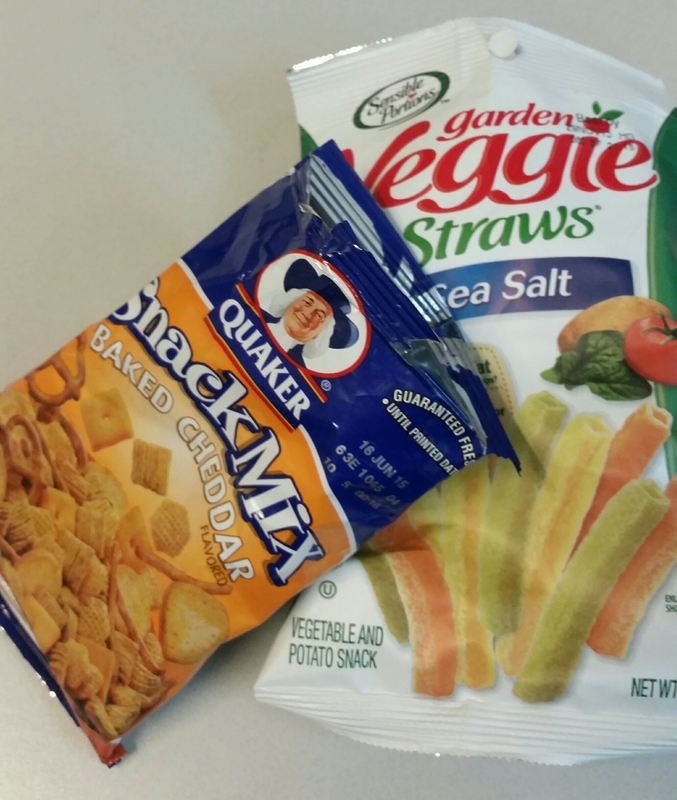 I pulled out another dollar from my pocket and went for the Garden Veggie Straws with Sea Salt. After all, it boasts of 30% less fat! For the entire bag, it had 130 calories and 7 grams of fat. If only I had chosen this bag first, then I wouldn’t have two bags in my hand. I was okay with the stats of the Veggie Straws. Of course, I would have liked for it to be 80 calories and 0 fat, but that’s hard to find for chips! I got back to my desk and opened up the bag of Veggie Straws and ate them with my sandwich. I wasn’t disappointed in their taste. Yummy! The Veggie Straws gave me just the right amount of crunch and the saltiness that I was craving. I would love for the story to end here…but it doesn’t. I then began looking at the Cheddar Snack Mix and wondered how they would taste. I figured I could open the bag up and take a few out to sample. I then planned on sealing the bag up with a clip so I could snack on them over the course of a few days. This way the calories wouldn’t be consumed at once. Sigh. They were good. Really good. Too good! Dana Lee, YOU KNOW BETTER! Why didn’t I just give them to someone as soon as I got back to my desk, or at least hide them in a drawer. Not me. Not Dana. I just had to have a taste. I just had to try and get a “better option” out of the vending machine, leaving me with two temptations. So instead of my normal 250 calorie or less lunch that I had planned, I now have ate a 537 calorie lunch. I would have been better off bringing what I had originally intended…the chalky white dried up baby carrots I threw away this morning. Lesson learned.